Minister of State (I/C) for Power and New and Renewable Energy Shri Raj Kumar Singh along with the Environment Minister Dr. Harsh Vardhan inaugurating rooftop solar plant at Gurdwara Rakab Ganj Sahib. Pollution and Global warming are worldwide concerns. A collective aim of sustainable development for our common future is necessary. Delhi pollution levels are one of the highest in world and India is among the top ten most polluted countries. We have a lot to do in order to make the environment better and not worse. India is a diverse country with a huge spectrum of languages, religions, castes, food, geography, culture, traditions, etc. According to 2011 Census, 99.76% of the Indians are religious. India has a rich history, cultures, traditions, and religions. People identify themselves as a part of a particular religion and believe in religious institutions. Each religion has its own set of beliefs, rituals, practices, morals, deities etc. People visit religious institutions as a part of following their religion or to offer prayers. Every religion has its own way of offering prayers and rituals. Often these rituals and prayers include offering the deity with flowers, food, etc which generates large amount of waste. As a result, religious institutions in India are going green. Various Eco-friendly measures are being taken up by religious institutions to help India become cleaner and more sustainable. It is further setting an example and spreading awareness for people to go green. Below are some recent Eco-friendly measures taken up by religious institutions in Delhi. India is aiming at generating 175GW of renewable energy by 2022. To support that aim, the Delhi Sikh Gurudwara Management Committee (DSGMC) has initiated One Megawatt Solar energy project. Four Historical Gurudwaras in Delhi, namely Gurudwara Bangla Sahib, Gurudwara Rakab Ganj Sahib, Gurdwara Nanak Piao and Gurdwara Majnu Ka Tilla will provide 1 MW solar energy. This solar project will generate around 4,000 units per day. 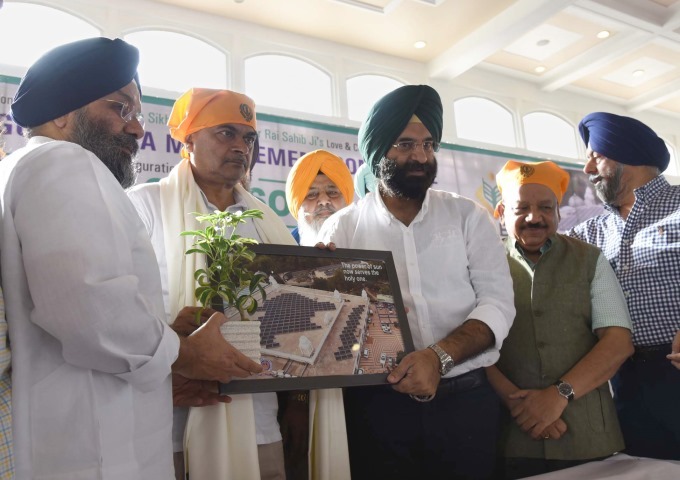 On 20th June 2018, Minister of State (IC) for Power and Renewable energy, Shri R.K. Singh inaugurated the 1,500 kW power capacity Solar plant developed by DSGMC at the Gurudwara Rakab Ganj Sahib. “India is making rapid strides in the field of renewable energy and we will overshoot the target of 175 GW renewable energy by 2022,” said Shri R.K Singh at the event. This initiative will help other institutions to go green and become conscious of the environment. The solar plant was inaugurated by Sant Balbir Singh Ji Seechewal and Baba Sewa Singh Ji. Shri Hardeep Puri, Minister of State (I/C) for Housing & Urban Affairs and Dr. Harsh Vardhan, Minister of Environment, Forest and Climate Change were among the dignitaries present at the occasion. Along with the prayers, devotees also offer flowers to the deities to show respect, attachment, and love for them. Flowers are a symbol of love, devotion, divinity, and purity. Flowers are used for decorating temples and shrines on festivals. Offering flowers is a part of many religions in India. These flowers dry up and are thrown away in landfills and rivers. Most devotees are unaware of the huge piles of flowers that are thrown away daily. The flower waste from temples in Delhi makes up almost half of the organic waste produced in the capital. To curb the problem, ORM Green, a non-profit organisation, has developed world’s first decentralized organic reject management (DORM) ‘Spoke-n-Hub’ model of a Flower Reprocessing Machine. This machine has been installed in Sai Baba Mandir, Lodhi Road, New Delhi. This has made the Sai Baba temple in Delhi one of the world’s first green and clean temple. Through this project, used flowers are prevented from getting dumped in Yamuna river and landfills. This machine can reprocess the used flowers and convert them into fragrant by-products which can be used to make incense sticks, biofuel for cooking, hawan saamagri, animal food etc. Each installation of this machine can prevent around 15,000 kg of used flowers a month from being dumped into River Yamuna. The Green Sewaks of Gurudwara Sadh Sangat are making various efforts towards cleanliness and healthy environment. Green Sewaks take the biodegradable waste generated in the Gurudwara to the Municipal Corporation of Gurugram’s pilot composting plant. Here, the waste is treated and converted into organic manure in an environment-friendly manner. Sinni Naithani a multimedia and mass communication student who is ready to explore, take challenges and work towards a healthier environment. Currently, she is interning with Delhi Greens. PrevIs This the Main Cause of Air Pollution in Delhi? Thank you for providing useful information. Keep up the good work.